The army is comprised of millions of moving parts, made of both man and machine. But without leaders like Louis, it wouldn't be the greatest on earth. PT Test High Score: 322 when they had the extended scale or 300 on my last PT test. Louis Greek spent seven years in the army before he decided to switch careers. He had been working as a mechanic, but wanted more. He wanted to be an officer—a leader. Of course he had been in the weight room too; the military code requires it of all members. He had been a PT stud and a fit man, but again, he wanted more. He wanted professional-grade fitness. So he dedicated his life to his body and set a course toward a life on the stage. He&apos;s closing in on the ever-elusive pro card, and he is stronger than ever. 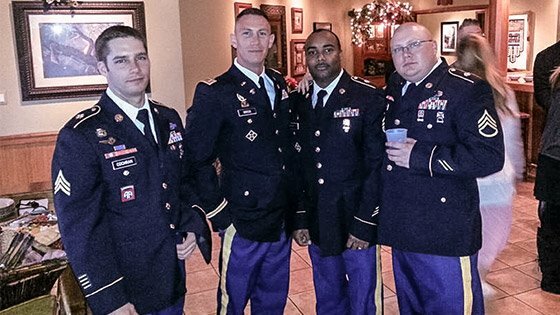 Learn what this veteran soldier does to impress and inspire his subordinates! When I was a kid I had idolized Arnold Schwarzenegger and always wanted to grow up and be a bodybuilder. But it was the military which really influenced my passion for fitness. As an adult I always stayed fit and worked out, yet in the last couple of years did I take it to a new level. In 2013 I competed for the first time at a National Physique Committee competition. My first competition I placed second in both my classes and my last show I placed third in both my classes. In 2014 my goal is to get my IFBB pro card. 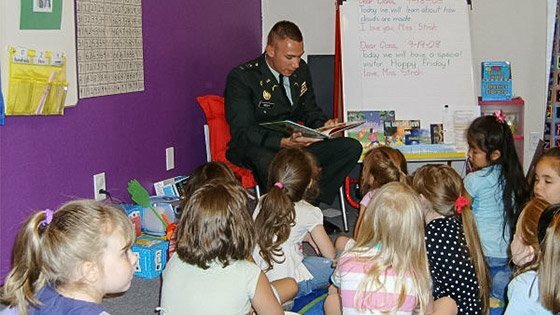 What inspired you to join the military? Both of my grandfathers served in World War II. Growing up I admired them and the sacrifice they made. The stories they told about their comrades and struggles they endured were inspiring. I wanted to do something bigger than myself. The G.I. Bill and tuition assistance program were big motivators as well, since I was a freshman in college when I joined. The skills and values I have acquired in the military over the years assisted me in being successful in many things I have done, to include bodybuilding. The self-discipline instilled in me is the same self-discipline used in my weight training, diet, and competitions. "The skills and values I have acquired in the military over the years assisted me in being successful in many things I have done." Coming out of high school I was not making the best choices. Joining the military propelled me to grow up fast and pushed me in the right direction to do something with my life. I won&apos;t forget the day I enlisted in Albuquerque, New Mexico. They handed me a bus token and told me to get to Fort Leonard Wood for basic training. Right then and there I realized I was on my own and I had to start acting like an adult. Early in my military career I had some great mentors who taught me how to be a professional soldier. This set a foundation for the next 17 years, all the way to my current position as a company commander. The majority of my military career has been in the U.S. Army Reserves or the U.S. Army National Guard. I constantly had to switch my frame of mind from civilian life to military life, which wasn&apos;t always easy. Describe your duties in the military. I spent seven years enlisted as a heavy-wheeled mechanic, something I had no interest in. When I joined, the options of jobs were not explained to me well by my recruiter. Ten years ago I decided to make the transition over to become an officer, and went to Officer Candidate School. I then became a Military Police Officer. In my civilian life I worked in law enforcement. I am a POST-certified Medicolegal Death Investigator. I believe the skills I obtained in the military crossed over and assist in my civilian career in law enforcement. Three years ago I switched to Military Information Support Operations, which is a whole different world, and seemed more applicable with the direction warfare was moving. It changed it immensely. If I was too tired physically to load my weapon, carry my gear, or push through the pain, it could cost me my life. As we also know, physical fitness has positive effects on us mentally; having a clear and sharp mindset was just as important. If you hadn&apos;t gone into the military, what occupation would you have pursued? I think I still would have pursued a career as a crime-scene investigator or in law enforcement. The military just happened to give me the mindset to go after my career aspirations and education. Absolutely. My experience as a military police officer set a tone and gave me experience working in civilian law enforcement. My current M.O.S. in Military Information Support Operations has positioned me for a civilian investigator job I am taking in Southeast Asia. I believe the biggest obstacle leading a military lifestyle is being away from family and friends and I think most service members would agree, especially around the holidays. Civilians don&apos;t understand that feeling or concept of being apart from loved ones and how hard that sacrifice can be. As a leader in my company it is crucial that I set a standard of excellence on my PT test. 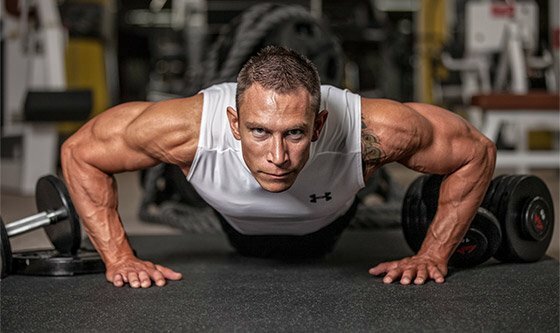 I want young and impressionable soldiers to understand the importance of fitness and how it relates to their career in the military, particularly to the safety of their lives and the soldiers around them when on mission. Do you think it&apos;s more or less difficult for military men to stay in shape, as opposed to civilian men? I think it is less difficult for military men to stay in shape. Service members have gotten creative with workouts, especially down range. True, we may work long hard hours in the military, but where there is a will, we will find a way to stay in shape. I have seen plenty of females who placed a lot of emphasis on fitness in the military and I have seen plenty of them beat males on PT tests. It hasn&apos;t affected me or the missions I have participated in. Let&apos;s face it, how war is fought has changed over the years, but the basic idea of a soldier is someone who can fight in combat. Part of being able to fight is being physically fit. Your life could possibly depend on it. "The basic idea of a soldier is someone who can fight. Part of being able to fight is being physically fit. Your life could possibly depend on it." We hear the Army often referred to as an "Army of One." Can you explain what that means? Being in the military isn&apos;t an easy job. Often we are away from family and friends. We work long hours doing a tough job most people don&apos;t have the guts to do. That is when we rely on our brothers and sisters in the armed forces. To survive we need to be able to depend on each other, to be one team, that "Army of One." Do you think the Army needs better physical fitness? As developments in physical fitness change with science and continuous research, I find it important that the Army keeps up with this as well. I think it is getting better, but they are always a little behind in the new developments in exercise science. 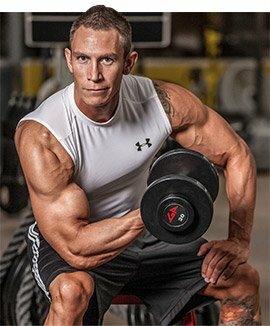 I recently met Steve Cook at a seminar at my gym. After talking with him I was inspired to try his Big Man on Campus workout. Currently Shane Heugly with Team Heugly designs my meal plan. I know there are a lot of nutrition plans out there and flexible dieting is very popular. I personally believe that whatever works best for you is what you should use. I drink a minimum of 128 oz. of water daily as well as Crystal Light, Powerade Zero or diet soda. I mix vegetables daily: asparagus, cabbage, kale, green beans, celery, broccoli, cauliflower, lettuce, or spinach. Salt, sea salt, and yellow mustard are my only approved additions. Once per week I replace Meal 4 with a small cheat meal made up of a protein, a carb, and a dessert. I am excited for the 2014 season. I plan to get my IFBB men&apos;s physique pro card at the NPC Junior USA Championships on May 24, 2014. That anything is possible. With hard work and dedication you can achieve your dreams and goals. Sacrifice is huge in the military. To obtain my pro card is going to require a lot of sacrifice and the military has given me plenty of practice for that. 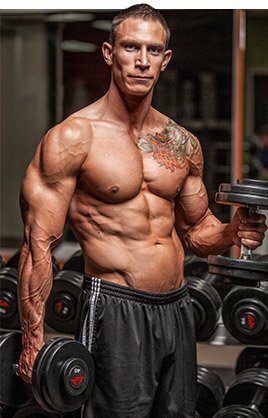 This past year my subordinates have seen my competition photos and it has inspired them to make healthy lifestyle changes and get into bodybuilding. I enjoy the sense of accomplishment to positively influence my subordinates. I have a few favorites, but I would have to say Phil Heath. He works out at my gym and is a very humble guy and always gives great advice. Take that discipline that has been instilled in you from your training and use that toward your fitness goals. If you do, you can accomplish your bodybuilding goals. Nothing is easy in fitness. The effort required to stand on elite stages is all-encompassing. Everything is coming together for Celena! Structure has a different meaning in the Marine Corps. The rigid rules are in place to save lives, but they also helped Russell keep his physique in competition-grade shape. Arvin did tours in the Navy and the Army, so he know the U.S. military like few men can. This career service member is a natural pro!